Many consider some American-born Chinese as "banana people", who are viewed as "yellow outside but white inside". But Fred Engst also jokes he can be likened to an "egg" instead - "white" outside like Westerners, but "yellow" inside and devoted to China. The 59-year-old American was born in Beijing as the first child of Erwin Engst, known as Yang Zao in China, and Joan Hinton, or Han Chun, who arrived in the country in the 1940s to help agricultural development. 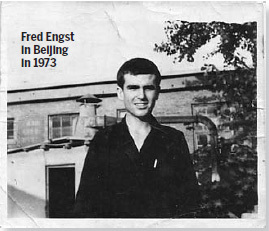 Fred Engst spent his first 22 years in China and was named Yang Heping. Heping means "peace" in Chinese. Soong Ching Ling, the wife of modern China's founding father Sun Yat-sen, met the pregnant Hinton at the Asian Pacific Peace Conference in Beijing in 1952 and suggested the name. Fred Engst's mother was a former scientist who worked on the Manhattan Project's atom bomb. But she was extremely shocked and quit the project when the US government dropped bombs on Hiroshima and Nagasaki in Japan in 1945. Hinton arrived in Shanghai in 1948 and went to Yan'an, Shaanxi province, where she married Erwin Engst, who had been working with the Party since 1946. The couple participated vigorously in China's efforts to build a socialist economy and worked extensively in agriculture. Fred Engst himself was determined to settle down in the Chinese capital again and became a teacher at the University of International Business and Economics in 2007, after more than three decades in his parents' home country where the people were the same as him "in appearance". "I can only feel at home here (in China)," the economics professor says. "I can easily tell right from wrong in China and can form my own opinion easily to evaluate a new social phenomenon, but I don't have a steering wheel in America," says Engst, who speaks in fast, pure Mandarin. "I just have no emotional grounds for judgments." The difficulty of finding like-minded people was the last push that forced Engst to return to his birthplace. If not for his daughters, Engst would never have thought of spending this summer vacation in the United States. It will be the first time he is visiting family since he returned to China. "Few Americans have interests in issues that I am concerned about, like the socialist economy and the 'cultural revolution' (1966-1976). But here, I can have access to rich resources, books or witnesses," Engst says. Engst says he is enjoying compiling his parents' records as well as reviewing and researching topics about his bygone days in China - between the 1950s and 1974 when he left China for the first time to the US out of curiosity. Engst spent his childhood in the Caotan dairy farm in Xi'an, capital of Shaanxi, before his parents were transferred to work in Beijing in 1965. In 1969, when he was 17, Engst was appointed as a worker in the Beijing Guanghua Wood Processing Factory. The "equal and harmonious relationship with comrades in the factory" was a special time for him. Engst says he had to struggle for more than three decades in the US, but the experience also made him realize why his parents believed in communism so firmly. "As part of the generation who suffered World War II, they witnessed and understood clearly that capitalism would inevitably lead to imperialism, which would then unavoidably result in war," Engst says.